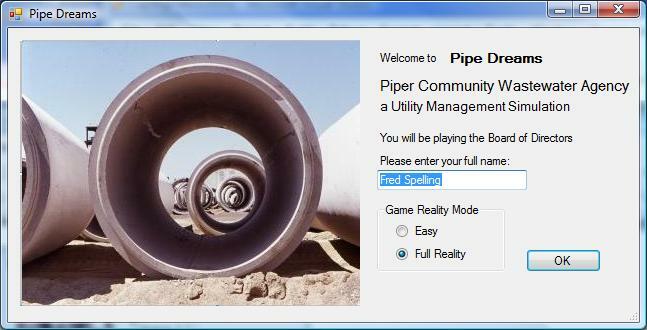 Pipe Dreams is an interactive wastewater utility simulation. Players face urgent major decisions that impact users and sewer system performance. These decisions have long lasting effects on the system and on user pocketbooks. The Player assumes the role of a Utility Board Member and is presented with critical decisions at each monthly Board Meeting. Decisions are made by approving or rejecting agenda items. The Piper Community Wastewater Agency operates three overloaded treatment facilities in a rapidly growing community. The plants are having a difficult time meeting their discharge permit limits and are in need of major upgrades and expansion. The sewer system strains to handle all the flow during large storms and has been known to overflow. Your job as a new board member is to build needed facilities while keeping rates low. Good Luck! The simulation requires Microsoft's .net framework v2.0. The installation process will check for its presence and ask you to install it if needed. This installation does not change your system or registry so you do not need administrative privelages to install the simulation. You do need administrative privelages to install the .net framework. Windows Vista includes the .net framework as part of the core system. You can uninstll the simulation using the Control Panel and clicking on "Pipe Dreams" icon. Follow the instructions to uninstall the simulation.